Our week (Paula, Riet Greenwood and myself) started Friday June 1st when we departed for France. 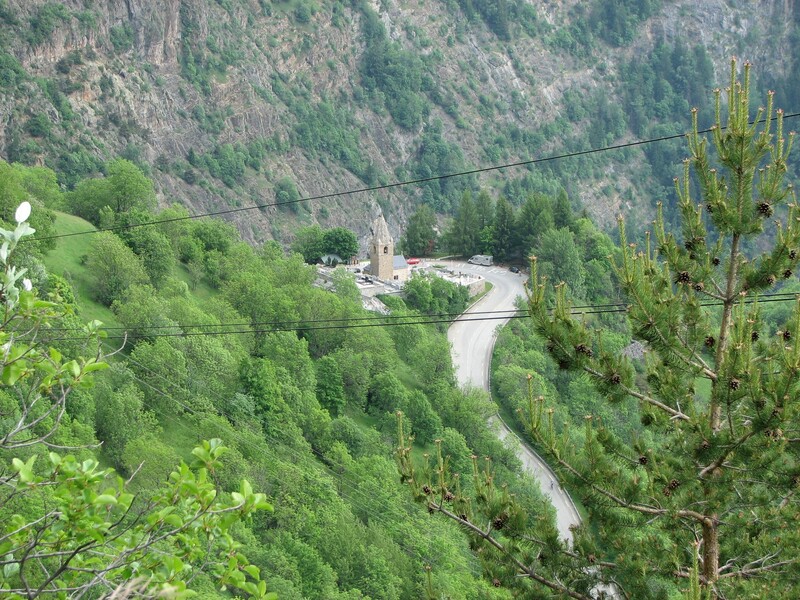 Our ‘base camp’ was situated in Villard-Reymond, a steep dead end climb from Le Bourg d’Oisans/La Paute (starting with the first 5k of the Col d’Ornon, then turning left in La Palud). The surroundings and views there are spectacular, the final kilometer of the climb resembling the Zoncolan – the flip side is that there are no more than 4 persons (on average) present during the weekdays and there is no convenience store anywhere in the area. So, after settling into the apartment Saturday morning, we headed down to Le Bourg – I was going to test my legs on the Alpe d’Huez while the girls went shopping. Despite the heat, it had taken me little effort to get to the top: a ‘net time’ on the ascent of just over 57 minutes. Three weeks earlier I was at the end of my rope as a result of the pain my injuries were causing me and at that stage I almost was about to give up the challenge (see the report on ‘Les Ménuires’). But this time around it felt good and that gave me some confidence, albeit I was still feeling weary. On Sunday I climbed the alp again, but by taking the route through Villard-Reculas this time. A surprisingly nice climb that was still quiet, as opposed to the increasing (car and cycling) traffic on the classic route. And because I had to be at the Palais des Sports anyway, to get the BIB-tags, my AD6 outfit and some physiotherapy, I climbed up the alp again on Monday. As it was getting very crowded by now, it took me over five minutes more this time, but I was still going strong. Nevertheless I was feeling worried that I might be testing myself too much. I decided to take the therapist’s advice to ‘take it easy’ the remaining two days – I couldn’t walk, let alone bike after the treatment anyway. While Wednesday was our day of rest, for 3,000 others it was their D-Day. They were confronted with (heavy) rain during the first half of the day, but eventually the skies cleared. Paula and Riet were volunteers in the merchandise shop and they were so busy that they hardly realized it when their time was up around 1:30 pm. We went back to our cabin, had an early ‘dinner’ and around 19:30 we went to bed. Of course I hardly slept, but I guess at least I rested. At 1:30 am we got up for a coffee and some pancakes and around 2:30 we went down to Le Bourg/Les Sables where the rest of the team was located. I joined the other guys for breakfast around 4:00 and some 35 minutes later we departed for the start. And at 4:58 sharp we started our first ascend! The first 1,5k or so to the bottom of the climb was a treat, with thousands of clapping and cheering supporters on both sides of the road. When the road starts going up – and it does so quite savagely the first 4 k or so – the cyclists scatter and a long ribbon forms itself. And even that early in the day, there were already a lot of supporters along the route, concentrating in the hairpins. While holding back, I still managed my first climb in around 1:10 – 1:15. I rested for some 20 minutes and went down for the second, which went just as good. Again in around 1:20 I was up there, taking another break and descending for number three within 20 minutes. Had I tricked myself into feeling too confident? Should I have rested more? Anyway, I managed that climb in little over 1:20 also and after a longer break I went down for number 4, but this time the ascend was a downhill ride. Probably the increasing heat (it was around 32 degrees Celsius in the valley) also had its effect, but every ‘weak spot’ in my body was accurately found and penetrated with hot iron rods and other pointy virtual objects. Fighting the nausea and red haze, my heart rate ever decreasing I struggled my way up in 1:45. I considered the possibility to wait it out and do a final run as a (complete) team starting around 16:30, but as it was only 14:15 or so, I felt I had to go down, try the 5th and then hope for a miracle (recovery) and pull out a sixth from some dark pit. The temperature in the valley had increased a couple of degrees, so that didn’t help. But hope and my virtual passengers pushed me forward. I guess Hubertus, Fest, Leontina, Harry, Ruud and Linda were doing their best, but it was in vain. I had to get off my bike ever more frequent and time seemed to run out ever faster. I knew I had to get back up within around 11:30 hours total (i.e. between 4:30 and 4:45 pm) and when I was at 11:10 in bent 8, I knew it was going to be impossible. Just around bent 5 Paula send me a text message ‘Where are you? The guys want to wait for you’. But after what seemed an eternity later just around number 3, I sat down in the grass and called her to tell the guys to leave – it was not going to be possible for me to pull out a sixth. Once you realize that, it’s over – I sat there for some 10, 15 minutes, staring at nothing, hardly hearing or seeing anything. 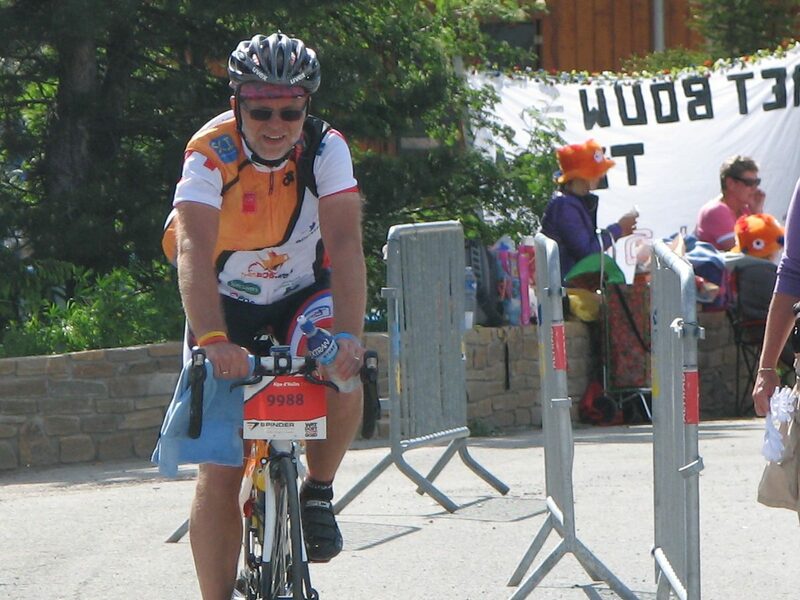 I then pulled myself together, struggled the rest of the way up – getting off my bike 3 more times, but cycling into the village at least – and after 2:35 (just the ascend) I crossed the finish line. It was close to 5:30 pm and I was glad I did not even have to consider another run, as I was simply out of time anyway. I seated myself in the car and immediately fell into a black hole. When Paula woke me up some 1,5 hours later, when the other guys arrived, I didn’t even realize how much time had passed. Not being able to complete six runs or do the last one all together, made me feel miserable again, but we crossed the finish line together once more. And that was it; Stefan, Roelof and Marten managed to climb the Alpe d’Huez six times, Ronnie, Werner and myself five times, Jeroen four times and Daniel three times. 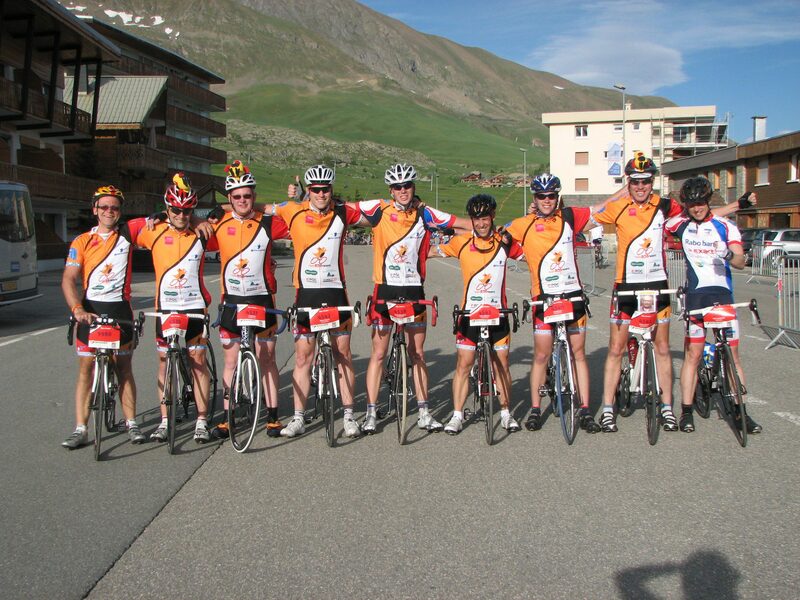 That’s 40 climbs among the eight of us and we’ve raised close 26.000 Euro. A good An excellent result and I’m proud to have been part of this very special team as well as the event. Not to be proud of your (own) achievement would be a great injustice to them. Of course, there is – or there will be – a price to pay, but I’ve chosen to be willing to pay it and so I’m not complaining. In the end, it doesn’t really matter whether you climb that mountain once, twice or half a dozen times, but the name of the event is Alpe d’HuZES. For those interested: the Garmin recording of the 5 climbs here. “Best of” gallery on my Google+ page here – look for more pictures in other albums. Below you find a link to the organizer’s video registration of my climbs, shot at various (fixed) points along the route – I’m not easy to spot sometimes and there are two or three fragments in which you can spot teammates Roelof and Marten also. I cooled down on Friday, cycling up the Col d’Ornon and the Grimpée Villard-Reymond/Col du Solude to our apartment; Saturday, on our way back home, I cycled up the Lautaret and Galibier – pictures of that last climb here.